Cardinal Oswald Gracias welcoming former President Pranab Mukherjee at a Christmas gathering in New Delhi on December 13. New Delhi, Dec 18: Assuring the people that the current expression of intolerance in public life is a temporary phase and nation’s religious and cultural diversity will remain unaffected due the incidents of intolerance, former President Pranab Mukherjee said that the Indian people will protect the plurality of Indian society. 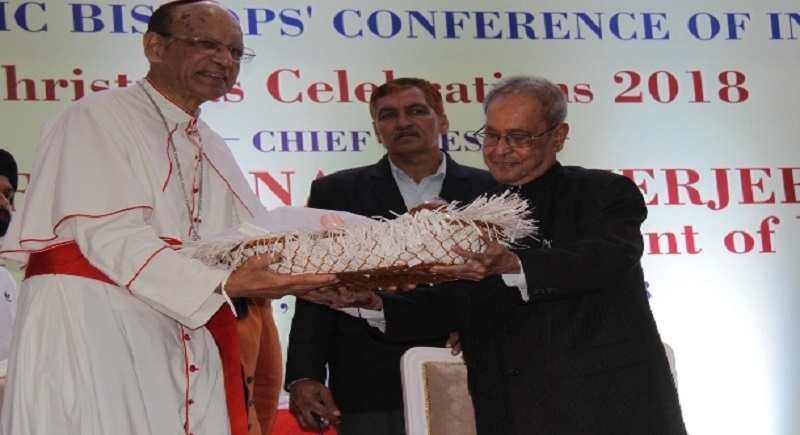 Mukherjee was speaking at the congregation gathered on the occasion of Christmas organised by the Catholic Bishops’ Conference of India (CBCI). The program was attended by Union Ministers, parliamentarians, bureaucrats, and around 500 invited guests. The ucanews.com quoted former president as saying, “we are definitely going through troubled times. Divisive tendencies, intolerance and prejudiced ‘fear of the other’ seem to be defining us today, but it is a temporary phase and the idea of India will prevail”. Mukherjee referred to the 5000-year-old history of India replete with tolerance and acceptance of the others, peaceful coexistence, adaptation and assimilation. “Indians will tenaciously fight this in order to once again establish our unique national identity, which has emerged out of our civilizational values and remains etched ever so clearly in our Magna Carta – the Constitution of India”, said the 13th President of India. The former President, whose five-year term ended 2017, noted that aberrations such as crusades, jihads and violent struggles between sects would always be defeated in the favour of brotherhood, peace and prosperity. He expressed appreciation for the Catholic Church's good work in the fields of education, health care and social services. Cardinal Oswald Gracias, president of the Catholic Bishops' Conference of India (CBCI), said conflicts between people and nations arose “because we don’t practice peace, love and fellowship.” Christmas was an appropriate time for Christians and non-Christians alike to reflect on such issues, Cardinal Gracias said. Hindu spiritual Guru Goswami Sushil Ji Maharaj agreed with Mukherjee that an atmosphere of hate and intolerance now exists in India. “There is no doubt that we are in a bit of a difficult situation, but soon that will vanish because our age-old tradition of co-existence still exists in our country,” he said.